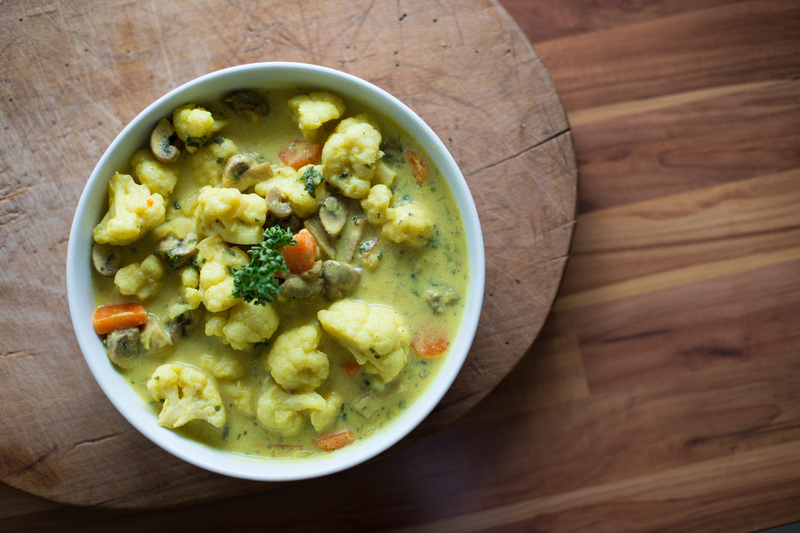 Today we would like to share a new vegan and gluten free recipe with you. Its super delicious and healthy at the same time. “Wash the cauliflower roses and blanch them in bubbling salt water. Chill with cold water afterwards. Clean and quarter the champignons and mushrooms. Peel the carrots and cut into slices. Roast the diced onions with olive oil in a big pan (all ingredients will end up in this one pan). Add the sunflower seeds and roast them, too. Dust with cornmeal and add cold vegetable broth. Then add the vegan cream and bring to boil.